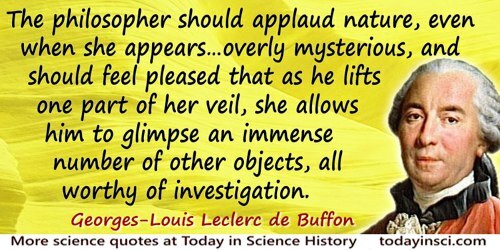 French naturalist who formulated a crude theory of evolution and was the first to suggest that the earth might be older than suggested by the Bible. 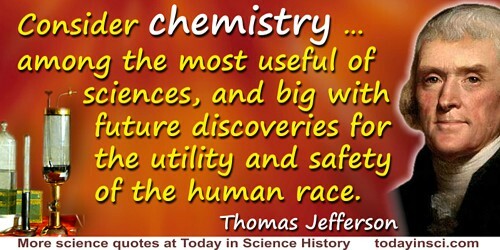 He proposed that the Earth was hot at its creation. An Individual, whatever species it might be, is nothing in the Universe. A hundred, a thousand individuals are still nothing. The species are the only creatures of Nature, perpetual creatures, as old and as permanent as it. 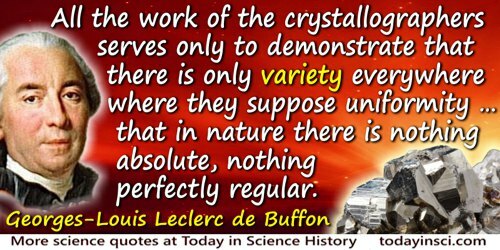 In order to judge it better, we no longer consider the species as a collection or as a series of similar individuals, but as a whole independent of number, independent of time, a whole always living, always the same, a whole which has been counted as one in the works of creation, and which, as a consequence, makes only a unity in Nature. 'De la Nature: Seconde Vue', Histoire Naturelle, Générale et Particulière, Avec la Description du Cabinet du Roi (1765), Vol. 13, i. Trans. Phillip R. Sloan. 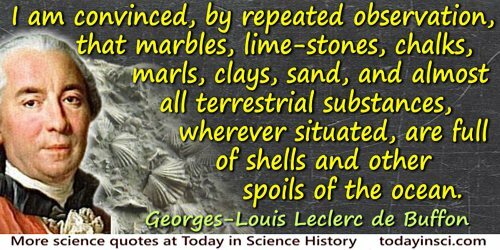 I am convinced, by repeated observation, that marbles, lime-stones, chalks, marls, clays, sand, and almost all terrestrial substances, wherever situated, are full of shells and other spoils of the ocean. 'Second Discours: Histoire & Théorie de la Terre', Histoire Naturelle, Générale et Particulière, Avec la Description du Cabinet du Roi (1749), Vol. I, 76-77; Natural History, General and Particular (1785), Vol. I, trans. W. Smellie, 13. 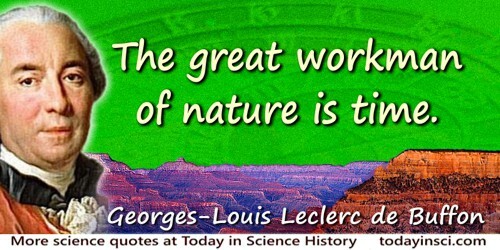 In general, the more one augments the number of divisions of the productions of nature, the more one approaches the truth, since in nature only individuals exist, while genera, orders, and classes only exist in our imagination. Histoire Naturelle (1749), trans. by John Lyon, The 'Initial Discourse' to Buffon’s Histoire Naturelle: The First Complete English Translation, Journal of the History of Biology, 9(1), 1976, 164. 'Les Animaux Sauvages', Histoire Naturelle, Générale et Particulière, Avec la Description du Cabinet du Roi (1756), Vol. 6, 60. 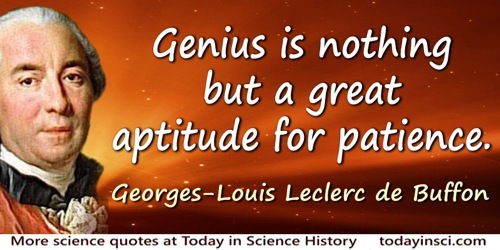 Quoted in Jacques Roger, The Life Sciences in Eighteenth -Century French Thought, ed. Keith R. Benson and trans. Robert Ellrich (1997), 468. To be and to think are one and the same for us. 'De la Nature de l'Homme', Histoire Naturelle, Générale et Particulière, Avec la Description du Cabinet du Roi (1749), Vol. 2, 432. 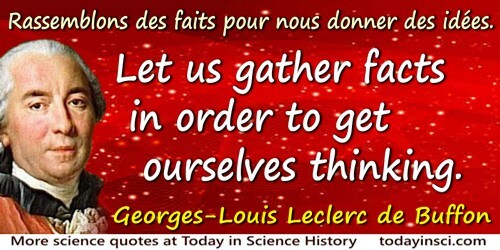 Quoted in Jacques Roger, The Life Sciences in Eighteenth- Century French Thought, ed. Keith R. Benson and trans. Robert Ellrich (1997), 434. 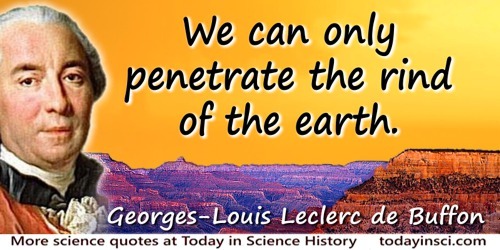 We can only penetrate the rind of the earth. 'Second Discours: Histoire & Théorie de la Terre', Histoire Naturelle, Générale et Parliculière, Avec la Description du Cabinet du Roi (1749),Vol. I, 70; Natural History, General and Particular (1785), Vol. I, trans. W. Smellie, 6. 7 Sep - short biography, births, deaths and events on date of Buffon's birth.